Remington's 9mm UMC line of ammunition provides shooters with high quality range ammo. This ammo features 115 grain metal case (Remington's term for full metal jacket) projectiles designed for range/target practice that exit the muzzle at approximately 1,145 feet per second. 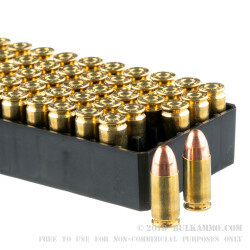 This reloadable, boxer-primed, brass cased ammo is made by Remington at their state of the art Lanoke, Arkansas plant. This plant uses employs many quality control measures including regular function testing to ensure consistency from lot to lot. The best ammo for practice i can find! Wow, ordered one day and received the next morning. So clean you could eat off of it! The headstamp code is R-P, which is for the Remington plant in Lonoke, Arkansas, USA. The boxes are clean and fresh, but I can't decipher the box date codes. I received it quickly and shot it quickly without an issue. Haven't had a single issue with the ammo, all has been used in my HP995. The 995 can be a tad finicky the way the rounds are loaded in the magazine but other than that, its good. I ordered two boxes of 500 rounds on Tuesday at 2:30PM and received the order on Wednesday at 2:30PM. Yes, just 24hrs after placing the order. Granted, I live in Atlanta and the warehouse is in Knoxville, TN, but it's still crazy fast! Inside the box were two smaller boxes and each of the smaller boxes contains 10 boxes of 50 rounds each. 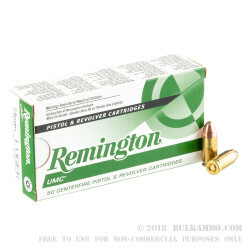 I bought 500 -Remington 9mm rounds from Bulkammo.com. great ammo at an awesome price. Great price for clean shooting rounds which do not jam. Great Ammo, Great Price, Great Service! 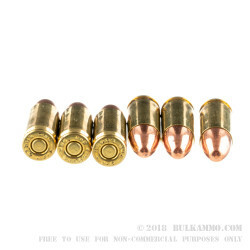 I had previously purchased ammo from Bulkammo.com and their service remains the best. When the ammo arrived it became a great excuse for me to get down to the range. I quickly shot 200 rounds through my S&W 1911, 9mm. I did not have a single failure to feed or failure to fire. I've used this well made Remington - 115gr MC before. I like the fact that it functions flawlessly and runs quite clean as well. You won't experience any extra deposits that would require more effort while cleaning your firearm after the range visit. I bought this ammo on sale and put all 500 rounds through my Beretta M9 in a single day. Not a single failure to feed or failure to fire. It seems to be fairly clean ammo as well and did not require any "extra" scrubbing or cleaning in my post range day cleaning. I just purchased a new Kahr CW9 (9mm). So I ordered 1500 rounds of the Remington 9mm Luger ammo to break in the gun. So far I've shot 250 rounds and not a single issue with the gun or the ammo! First order for 500 was on-time and quickly delivered. The second order of 1000 rounds I got on sale and saved a bit; still got it in just a few days! The amazing thing to me was, that each order was followed up with an email to inquire if my order was delivered OK and all was good. I mean, how many companies DO that? Great prices, great delivery, reasonable shipping charges. What's not to love!?! My Glock 19 functioned flawlessly with this. Very good ammo, no misfires, jams etc. Good accurate ammo for my G 19. A very "painless" way to buy ammo! This ammo is the same stuff you pay full retail for at the "XYZ" store. I shoot this in a G20 Glock with a LW 9mm conversion barrell and after I put in a bit lighter spring it functions flawlessly! Good plinking ammunition, no FTF/FTE, etc.. all 500 fired flawlessly out of my Ruger LC9. Looks like pricing on this ammo went up ~$10 from last time i bought it so might spend the extra ~20 and get Winchester instead. Okay, this is simple. Remington UMC 9mm is solid good ammo; perfect for plinking & target practice & even some IDPA. Great Ammo + Great Price = GREAT DEAL. I purchased a new Beretta 92FS semi-automatic pistol and fired 500 rounds of this ammo at in indoor range. There were no duds, but I experienced jams and stovepipes about one out of 20 rounds. Admittedly I'm a total newbie and probably don't know what the hell I'm doing, and it is a new firearm, so maybe it needs to be broken in a bit. But the instructor at the range checked out the pistol thoroughly and said that it was in perfect working condition. I bought a box of "Brand X" ammo and let the instructor squeeze off 50 rounds. No problem. Then I had him fire 50 rounds of this product, and he had five jams. Better price and better performance! I was buying brand X to shoot at the range. It was not bad, but it was not good either. This Remington Ammo performs much better and with a cost savings. No jams, no duds, hits where you point it. Shipping was quick on 1000 rounds and everything was perfect. Q: Is this a re-loadable brass casing? A: This brass may be used for reloading. Brass and Boxer Primers are the two key components to look for when reloading spent cartridges. Remington also offers a smaller line of nickel plated brass. While this may look similar to aluminum or steel ammo (not reloadable), nickel plated brass may also be reloaded. Q: Will this work in most 9mm even if it is a luger round? A: "9mm Luger" is a common description for 9x19mm, which is also known as 9mm Parabellum and colloquially as 9mm. So, yes, this ammo will work in a handgun chambered for 9mm. Q: In the past I have had problems with other brands of American ammo where even in the slightest moisture they fail to fire and become duds. During an outdoor range session I had a box of ammo out, primers up and a light mist rain fall rendered about a third of the box into duds. While this made for good failure drills its not economic... I switched to a popular Russian brand and no problems with moisture, even in the same conditions where the other brand failed. I would like to find a brass cased ammo that can be used reliably outdoors in the Pacific North West. I am preparedness minded and I simply can not store ammo that fails to function in moisture. Does this ammo have any history or features that lent it to reliability while outdoors in wet conditions? Thanks. A: It is unlikely that the conditions you describe would cause failures to fire in any ammunition. What is more likely is that the firing pin of your weapon did not strike the primers hard enough to reliably fire them, but the primers of the Russian ammunition were slightly softer and allowed a lighter strike to reliably fire the primer. If this is not the case, it might be a good idea to purchase different brands of ammo and test them in the conditions you might encounter, then select the one with the best performance. Q: My wife and I have shot this ammo in the past with my Glock 19 and had a few issues. It seemed the ammo was a little underpowered and failed to feed properly when my wife shot. Did I get a bad batch or is this a known problem with this ammo? Is there another inexpensive practice round you would recommend? A: It is difficult to say without observing what is actually taking place. If the problem is isolated to one shooter, there may be issues of technique, but perhaps a different ammunition would also solve the problem. If the issue occurs with multiple shooters, the call for a different type of ammunition grows stronger. Q: So is this the best ammo to shoot at the range? 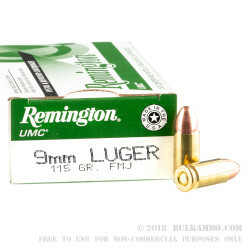 A: This Remington UMC 9mm ammo is great for range practice, training, or plinking. Q: How clean does this ammo run? Would be buying this ammo for a pistol class where I need 1000 rounds. Thanks for the help! A: This ammo is fairly average in terms of cleanliness - if you're looking for cleaner ammo, check out Magtech CleanRange or Remington LeadLess. They use lead-free primers, which are cleaner burning than standard lead styphnate primers. Q: How long can we store the boxes of ammo without significant impact to reliability ? Does use of an old "mil-spec" type ammo can (water tight gaskets) increase the time or is there any other trick / technique to allow 10-20 year time frame?? A: Any ammunition that is stored properly should last for many years. Keeping the ammo in a cool, dry place away from heat and moisture/water sources is very important to ensuring that it lasts for a long time. Q: Have a brand new Ruger P95, is this a good ammo to start out with? A: Yes, this would be a good ammo choice for a Ruger P95. Q: What is the reliability of this ammo? Does it play nice with a Glock 17? A: This is very reliable ammo. To put it simply, pretty much everything plays nice with a Glock 17. Q: My father has been debating with me for about a week on this he is trying to tell me there is no measurable difference between .380 and 9 mm I keep telling him he better put me at the top of his will if he tries to prove that theory. I have only ever owned a 9mm, what are the differences between .380; 9 * 18; 9 * 19; and 9mm Luger? A: There is a rather large difference between 380 Auto and 9 mm. 380 Auto ammunition is loaded with bullets that weigh under 100 grains, often under 90 grains, and are traveling at approximately 900 ft./s. 9 mm Luger ammunition is loaded with bullets that weigh between 115 and 147 grains, with velocities between 1000 and 1300 ft./s. 9 x 19 and 9 mm Luger are identical. 9 x 18 is a Soviet bloc cartridge that is essentially identical to or perhaps ever so slightly more powerful than 380 Auto, but is not interchangeable with 380 Auto at all. In fact, none of these cartridges are interchangeable or should be fired in any weapon not intended to fire them. Q: Is this ammunition suitable for a self defense round? I have heard that FMJ 9mm is not, but I'm not 100% sure. A: It would be more advisable to select expanding ammunition, such as jacketed hollow point (JHP), solid copper hollow point (SCHP) or expanding full metal jacket/expanding mono block (EFMJ/EMB) for self defense. Q: One is none, two is one and three is done. I have followed this philosophy for my firearms and purchased two Glock 26 models and one Thureon Defense carbine, all three of which use 9mm ammunition and the same magazines. In keeping with efficiencies of use, which 9mm ammo do you recommend that can be interchangeably used in each of these weapons? A: This Remington ammunition would work well in a Glock 26 - as would practically any 9mm ammunition - and the Thureon Defense website recommends the use of all ammunition except CCI Blazer aluminum cased ammunition. So, it would seem that you have a pretty wide selection. Q: Is this the cheapest 9mm? A: Ammo prices change frequently, but UMC 9mm is generally very affordable. Q: Is this product appropriate for target practice with a Beretta 92FS at a 20-yard indoor range? A: Remington's 9mm 115 gr MC (Remington's equivalent terminology for full metal jacket) ammo is a great choice for a Beretta 92FS with its reliable functioning and accuracy. This ammo is cleaner burning than many available options making it a good choice for many indoor ranges. You'll want to double check however with your specific range to ensure that they do not have any leadless ammo requirements like some indoor ranges have. If they do require leadless ammunition, you'll want to go with a load that features a fully encapsulated projectile to reduce lead exposure such as Remington's FNEB load or equivalent.